I had an opportunity a little while ago to indulge in some speculative conversation with Giorgio Tsoukalos, producer of the Ancient Aliens TV series, on the topic of why it might be that evidence of advanced prehistoric civilizations is systemically dismissed by traditional scientists, educators and social engineers. WE MIGHT BE ALIENS: Or we might not. 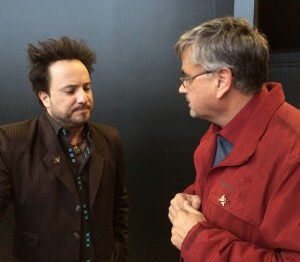 Here I am discussing the possibilities with Giorgio Tsoukalos of Ancient Aliens fame. Note that I didn’t say evidence of alien intervention in human history. We were talking about physical, not interpretative, evidence — in particular, precisely engineered megaliths of staggering proportion, many with astronomical reference points and exhibiting similar building styles wherever they’re found around the world. In spite of his in-show enthusiasm and the Internet memes that might lead you to believe Tsoukalos always arrives at the same conclusion — “aliens did it” — he expressed confidence that early humans likely carried out the work, under the tutelage of advanced instructors, whomever that might be. We see eye to eye on some points and have differing viewpoints on others. Nevertheless, I found his insight refreshing, in part I’m sure because in him I see a fellow traveler predisposed to welcoming for consideration ideas that don’t check first with authority before flexing their wings. On the matter of whether extraterrestrial intervention might figure into ages-old mysteries that modern science has no tools to solve, I would defer to his insight — the perspective of one having immersed himself in practical research on the subject — over pronouncements made by an obedient believer in some official orthodoxy. Unlike those wont to toe official lines, the impression he left with me during our conversation at the “George Noory Live” event in Toronto is that he has little regard for merely being right, preferring instead to be correct in contributing to the body of human knowledge. That is a position I can respect. It creates an environment where ideas can live or die by their own merits, not because they were propped up by conventional expectation or snuffed out by well-armed thought police. Quite frankly, I’m as curious about the outrage generated in official circles by public exploration of non-sanctioned themes as I am paleo-SETI belief itself. Curious because one doesn’t ordinarily expect to see emotion supplant reason in academic argument. Yet, scientific minds (and people who wish to be regarded as scientific) are regularly counted among the most virulent detractors of Tsoukalos and the ideas his Ancient Aliens and In Search of Aliens shows look into. It’s easy to dismiss cranks such as science writer Brian Switek, whose minds are made up before any data enters the equation. Just as easy to wave away gotcha-focused skeptics like the Amazing Randi (a stage magician, not a scientist) and Robert T. Carroll (a former philosophy professor whose comfort level with ridicule as a weapon undoes his claims to being a defender of critical thinking). Easier still to ignore impassioned professions of unbelief by non-credentialed people, because ordinary people quite often are found vigorously invested in attending to the enforcement of whatever new social “norm” the shapers of public conduct hand to them, even when it conflicts with their own instincts and jars their moral compass. But the ignorance found hiding in pontification by the so-called learned — educated persons who possess a peculiar need to shut down a conversation, either by winning the argument at hand or nuking it — is the car wreck I can’t stop gawking at. None of these have anything useful to contribute to the conversation. Oddly, those who hurl the harshest slurs at Tsoukalos (and others I am interested in hearing out) tend to be blind believers who are oblivious to disagreements among physicists who ponder theories such as the Big Bang and fantastic mathematical destinations implied by quantum physics. Because intelligent discussion demands not only a willingness to consider another point of view but a willingness to abandon your own should it be exposed as deficient, it is often the detractors themselves (and not the ideas they seek to suppress) that come up short. For the record, I regard the Big Bang theory as pointing to a beginning, not the beginning. Because the math and the physics comprising it are sound (until it reaches its self-contradicting conclusion), I see it perhaps fitting more sensibly as a component in a larger framework somewhere down the road — in a theory that does not demand the annihilation of physics as we know it in order to be true. Ancient alien theory is for the most part practical: extrapolations and projections arising out of the examination of still-existing structures from antiquity, and of startling similarities between ancient cultures our educators have told us could never have crossed paths. Perhaps it is because it is practical, and I own the tools to cross-reference against a fairly wide spectrum of thought any assertions made, that I lend it an ear more readily than, say, delightfully titillating yet ridiculous realities proposed by quantum physics. I prefer practical over fanciful, and I do not suffer gladly shrill detractors who appeal to impractical mathematical destinations they themselves have not calculated to somehow put me in my place. I am not intellectually affronted by being shown in high definition spectacular visual evidence of advanced civilizations from antiquity. When I’ve lived the experience of seeing man on the moon, our robotic craft routinely landing on Mars, Earth vehicles venturing beyond the solar system and now one having made a crazy rendezvous with a speeding comet millions of miles from home, I detect nothing scientifically incongruent in the premise that these ancient possessors of exceedingly great knowledge and technology might have been aliens, either regularly visiting Earth or having become stranded here. Also, in a day where genetic manipulation on some level has become ubiquitous, I’m not prepared to dismiss as ludicrous the possibility that they could also be our sort-of ancestors. And by extension, ideas about human giants, disfigured people and hybrid creatures — suggested on Ancient Aliens as perhaps the basis for some of the mythical creatures of folklore — might be discomfiting but not entirely dismissible when considering the almost-certain pitfalls inherent in genetic experimentation. Nor am I moved to scorn the proposition that technology-wielding beings (whether alien or simply more advanced humans) might account for the origin of gods among primitive cave-dwellers. After all, the human record is littered with accounts of primitive people being awed to the point of reverence by strangers arriving with more advanced technology than had existed in a particular locale. Thank you for the intellectual stimulation, Ancient Aliens. Thank you for presenting for my consideration fresh ideas, without having first set a trap whereby a proposition on the one hand is followed by demand on the other that I accept your conclusion. (Been down that road. Hated it.) Propose away. I am perfectly capable of determining what is reasonable and what is far-fetched. Show me more! I was a fan of Swiss author Erich von Däniken’s groundbreaking book “Chariots of the Gods?” in the 1970s. Even while unsettled by the implications for obeyed faith and thus-far-acquired understanding of the nature of things, I found the possibilities too breathtaking to dismiss as idle fiction. Also playing out in real time was the development of space travel, which I followed on an intimate level. Add to that scriptural familiarity derived from instruction in Old Testament writings, and I must admit I was left with a rather generous head start on assembling an analytical toolset capable of interpreting the data coming my way on these matters. The years would see many of von Däniken’s assertions worthy of being built upon, some that couldn’t stand up to the test of scrutiny and some better suited to an early death. Such is the nature of exploration. I salute him for daring to promote a difficult-to-prove idea for public consideration that, judging from hysterical outrage where one might have expected simple wave-of-hand dismissal, must have rattled some cages in the establishment. Much of it, even back then, made conceptual sense to me, aided and abetted I’m sure by the decade-old U.S.-USSR space race — factual evidence of how spacefaring citizens of another world could arrive here: the means and the math to move a vehicle from one heavenly body to another. Even in this era pre-dating the Hubble telescope, which would yield discoveries of potentially habitable planets at a dizzying rate, reasoned thought allowed for extraterrestrial life to be more probable than improbable. Is that outrageous? Or worse, a call for outrage? While there is no reason to believe the caveman and the possessor of advanced engineering could not co-exist (with apologies to the Darwinian evolution timetable), it would be ludicrous to believe the monkey conducted the orchestra: primitive humans might have put in the labor on building the megaliths, but a much more advanced race than these had to have engineered them, and furnished the tools as well. That later generations of humanity might have used the megalithic sites as places of primitive worship and savage ritual says nothing about the mindset of those who built them, no more than would later crystallization of belief in a superstition accurately describe a real-world event then being referenced from a distance. Because modern history does not peer far enough into the past to satisfy questions surrounding their construction, it is equally shortsighted and unsatisfactory to declare as their purpose the superstitious ritual it found evidence of in the less-distant past. What’s more, peoples given over to superstition and other expectations of magical occurrence do not build, especially on so grand a scale; analytical (scientific) minds do that. Yet it is mainstream education, not ancient astronaut theory, that insists on you accepting that unfathomable premise — even as you gaze upon exquisitely engineered structures built using quarried stone blocks that weigh hundreds of tons and are known to have been not only transported from miles away but hoisted into place using technology we cannot duplicate today. Historians would be wise to acknowledge the more likely scenario: the human-sacrificing primitives they found having deified the great structures and the “gods” who engineered them were the descendants of survivors of a calamity or desertion, now trying to make sense of a fading memory of what had existed before. That a seemingly vast understanding of astronomy (science) somewhere along the way devolved into astrology (occult) underscores this point. I applaud Ancient Aliens for the clarifying visuals, particularly in showing numbers and scope of the world’s enduring megaliths, along with locations and timelines that reveal interconnectedness otherwise difficult to grasp. More importantly, I applaud Tsoukalos and his cast of commentators — speculators yes, but none of them janitors, shopkeepers or phys ed teachers — for removing from the equation reliance on useless magic as the one-size-fits-all explanation for practically everything in distant human history. There is nothing too-fantastic-to-believe about space travel. It is a feat of engineering, albeit advanced engineering. Calculation, not magical incantation, is what would go into the formula for traversing the space between Earth and Mars or between some planet in another star system and Earth. Nothing beyond practical scientific purpose and marvelous engineering is being proposed to explain construction of the pyramids in Egypt or any of the other megaliths around the world. Nor is there anything magical or spiritual, and certainly not primitive, implied by their peculiar alignment with the stars in Orion’s Belt. Assertions concerning evidence of advanced knowledge of astronomy being here much earlier than you’ve been educated to believe are scientific in nature, not in any way references to the supernatural. There is no dispute that astronomy, as opposed to astrology, is a science having been learned. Perhaps a knowledge once lost and now regained, but a science nonetheless. The argument is that there is no evidence of it ever having been a primitive pursuit. There is nothing magical or unscientific inherent in the proposal that DNA manipulation on hominids might have jumpstarted what distinctively became the human race. We cannot yet confirm whether it could be performed on the scale proposed by ancient astronaut theory, but that is a question of scientific practicality. Revealing the intriguing frequency of references to flying craft in unrelated ancient texts should ignite curiosity, not outrage. As unsettling as the revelation might be to those with a vested interest in the status quo — they who are rattled by its appearance outside the safety of myth, they who need Darwinian evolution to keep on representing the one true timeline — how can it not be possible in the context of prehistoric advanced civilizations? There is no need to suspend belief in the universe as you know it in order for ancient astronaut theory to be a plausible consideration. Think about that as you calculate the degrees of unquestioned faith necessary to reconcile “realities” that include millions of instances of you existing in millions of parallel worlds. Mainstream historians would have you believe widespread superstition and savage worship is a legacy of early humanity. Perhaps it is. Perhaps it was an enduring one, too. But to appeal to this tendency toward magic as the motivation for great, enduring structures serves only to obscure evidence of something — someone — greater. Moving such unrealistic conclusions forward into the education system is a crime against the body of human knowledge. So is obedience to an establishment that insists on doing so. These, and not the musings of unsanctioned inquisitive minds, are the real enemies of science. Asking questions has never hurt anything legitimate. This entry was posted in Uncategorized and tagged Ancient Aliens, Chariots of the Gods?, Darwin, Erich von Däniken, George Noory, Giorgio Tsoukalos, Robert T. Carroll, the Amazing Randi on November 28, 2014 by admin.